Although Calderwood Castle is not in our Blantyre Parish, the one time Baronet, Sir William Maxwell ,whose seat it was, used to be a heritor of Blantyre with a large property and business interest in Blantyre in the 18th Century. This article below gives a little bit of background about the Castle and more importantly for Blantyre, an article published about the 1773 disaster written by Joanna Baillie a then contemporary writer who lived in Blantyre. After the history, the article is published below, exactly as it was written. 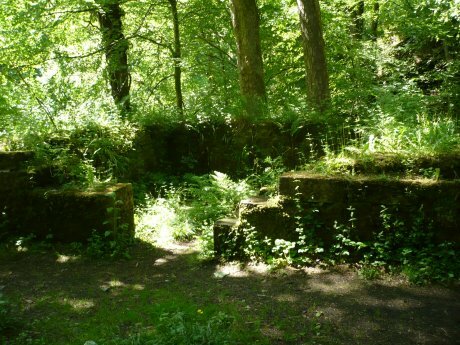 Calderwood Castle was originally a fortified keep otherwise known as a Scottish Peel Tower. It was built on the western banks of the Rotten Calder Water between the 13-14th centuries. However it is almost certain that an early building stood on the site some time prior to 1246. The original castle building was composed of two towers built perhaps 100 years apart, one abutting against the other giving the middle wall an extreme thickness. It stood almost 90 feet tall and most walls were about 7 feet thick. There was a wheel stair which led from the Bell House and Parapet walk at the top of the tower, straight down to the water, possibly indicating a secret passage. This building was added to in the mid 18th century with two large mansion house wings. In 1773 days of heavy gales and rain caused the original towers to collapse into the roaring torrent, and the stables which lay beneath the castle were buried by rubble, but survived due to their strong arched roof. No possession or soul was lost apart from one of the hunting dogs, because the event was forseen by a local clergyman who was tutor to the castles children. They moved into the extension and rebuilt the ruins into another modern mansion. a century later in 1845, the then owner who was highly artistic and romantic decided to add a grand gothick extension to the existing buildings at a cost of £50,000. The centre piece was an octagonal tower. 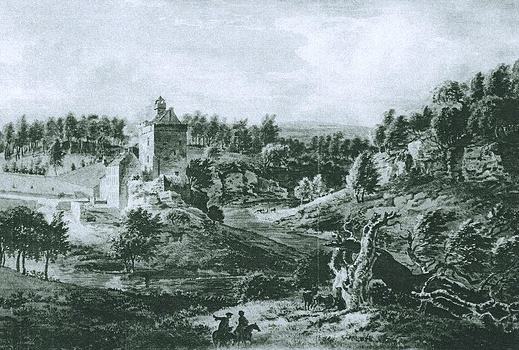 The family who lived in the castle were the Maxwells of Calderwood who obtained it through marriage in 1246. 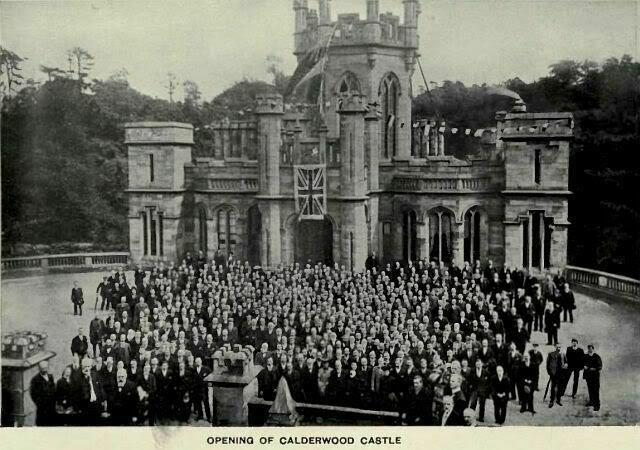 The original owners were known to have went by the surname of Calderwood. It is almost certain that anyone bearing the name Calderwood originally descended from the owners of this castle as the name was derived from literally ‘woods beside the Calder’. The Rotten Calder meanders through a unique deep wooded ravine with precipitous ivy-clad cliffs and crags. The valley is known as Calderglen and in the past Calderwood Glen. It would be impossible here to do justice in words, the incredible romantic secluded beauty of Calderglen, and it most certainly deserves a visit. However do not visit the main path, go off trail and explore the long-lost nooks and dells. The valley falls within the modern Calderglen Country Park based at Torrance House. Their are over 10 miles of nature trails and countless beauty spots and magnificent waterfalls. The castle was bought by the S.C.W.S in 1904 and by 1947 it was starting to be demolished due to disrepair and the cost of upkeep, their was also a severe fire at one point. By 1951 all that was left was the octagonal tower, which was blown up that year by the army as part of an exercise so that the council could get around the costs. All that remains now are the former border and retaining walls and terraces, a ruined crypt and a folly Castle named ‘Craigneith Castle, the foundations of the Stables, a ruined Well and traces of the formal gardens and an artificial pond and fountain, as pictured in this recent photo. It’s a beautiful walk and is nearby enough to Blantyre to be of interest to many local people. Thanks to Chris Ladds for much of this article. I remember playing in and around the castle tower in 1940’s,there was only the tower left the rest was just rubble ,1944 there was a convoy of troops all the way up the drive which stayed for only a few days and were gone presumably for the landings in normandy. Recently discovered I was a Calderwood! I have been researching my roots and found this article. Thank you for Informing me.